1. Check for “Broad Spectrum Protection.” A good sunscreen has “Broad Spectrum Protection,” also known as protection against UVA (long rays) AND UVB (short rays). Both UVA and UVB rays reach the earth’s surface and are responsible for causing sun damage. UVB rays are stronger during hot, summer days and are more closely associated with sunburn and skin cancer. On the other hand, UVA rays are present everyday of the year and penetrate further into the skin. These are the rays that you can blame for wrinkles and sunspots. 2. Physical vs Chemical sunblocks. Both physical and chemical sunscreens can protect against UVA and UVB rays and you need sunscreen that protects from both. Physical sunscreens overall have a slight advantage when battling UVB rays, while certain chemical sunscreens are better for combatting UVA rays. When looking for a sunscreens, you’ll see ingredients like Titanium Dioxide and Zinc Oxide; they are physical sunblocks, which work by reflecting rays when they hit the skin. These minerals are your best defense against those UVB rays that will burn you at the beach. In addition, their mineral particles are most often large enough, where they cannot be penetrate the skin, unlike the particles in most chemical sunscreens. Have you ever seen words like Avobenzone, Oxybenzone, Octorylene, Octinoxate, or Octisalate? These are the chemical agents most often used for sun protection in sunscreens because they feel lighter and are easier to apply than physical blocks. These chemicals work by fighting sun damage when your skin absorbs sun rays. Avobenzone offers the broadest protection of any chemical sunscreen, but unfortunately, it is not a very stable ingredient. Neutrogena’s products contain Helioplex technology, which combines Avobenzone with Oxybenzone to stabilize the sunscreen and prevent it from losing effectiveness after a few hours of sun exposure. Similarly, Aveeno uses an Active Photobarrier Complex for the same purpose. The most powerful chemical technology involves Mexoryl SX (Ecamsule) and was pioneered by L’Oreal. It combines Avobenzone with Octocrylene to offer very broad, superior protection against UVA rays due to its high photostability. So at the beach this summer, go for broad spectrum protection that contains physical sunscreen. Personally, I prefer physical blocks because they are often less irritating, more natural, and zinc oxide is especially great for blemish-prone skin like mine. The downside to physical blocks? Since they are insoluble, they sometimes leave you with a chalky, matte look. But hey it’s better to look chalky than burned! But for everyday use, a good broad spectrum sunscreen that contains Mexoryl or other UVA blockers are good because they are more cosmetically elegant, and may sit better under makeup. 3. Look out for the Sun Protection Factor (SPF) of at least 15, preferably 30+. The SPF refers to approximately how long the product will delay sunburn. 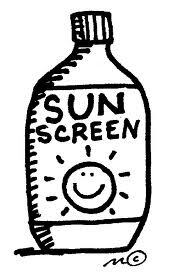 For example, a person wearing SPF 30 can stay out in the sun without burning 30 times longer than if he/she were not wearing a sunscreen. SPF 30 products filter out about 97% of UVB rays. SPF 15 filters out 94%, while SPF 45 filters 98%. In other words, SPF levels after 30 only have a very marginal benefit. Even though SPF levels on paper look like they only have a very marginal benefit, I still recommend you use as high as your skin feels comfortable with (the higher the SPF, sometimes, the heavier the sunscreen texture,) since often we don’t apply enough in amount nor frequency to get the full benefits of the SPF. Unless you apply sufficiently, your SPF 30 might only be giving the benefit of an SPF 15. 4. As with all products, don’t forget to make sure that the product is phthalate and paraben-free! Remember that sunscreen isn’t only for the beach because the sun is out everyday. Half of Americans who live to age 65 will develop skin cancer at least once in their lifetime. That’s A LOT! To prevent sun damage and aging, make sure you are wearing sunscreen on your face and neck area everyday (even if it’s cloudy outside). I use the Alison Raffaele Face Forward Age Response Primer with SPF 15 on top of my moisturizer, even if I am not wearing makeup on top. This gives my skin a smooth, velvety finish and protects my skin with its frutta da vita antioxidant complex. Another bonus is that it uses a physical SPF, which supplements the chemical sunscreen in my moisturizer to offer optimal protection against both UVA and UVB rays. There are also some other measures you can take to protect your skin. I like to use JUARA’s Rice Facial Cleanser, Tamarind Hydrating Tea Toner, and Sweet Black Tea and Rice Facial Moisturizer everyday. These products all contain rice bran, a natural source of vitamin E and are rich in PABA. Both of these ingredients are excellent natural sources of sun protection. Since rice bran is super hydrating and calming, it reduces redness soothes skin that has been exposed to sunlight. And Sweet Black Tea and Rice Facial Moisturizer is non-greasy and light-weight…perfect for the summer! Checkout this website to see some great natural sunscreen products! For more information and updates from JUARA like us on facebook and follow us on twitter and pinterest.